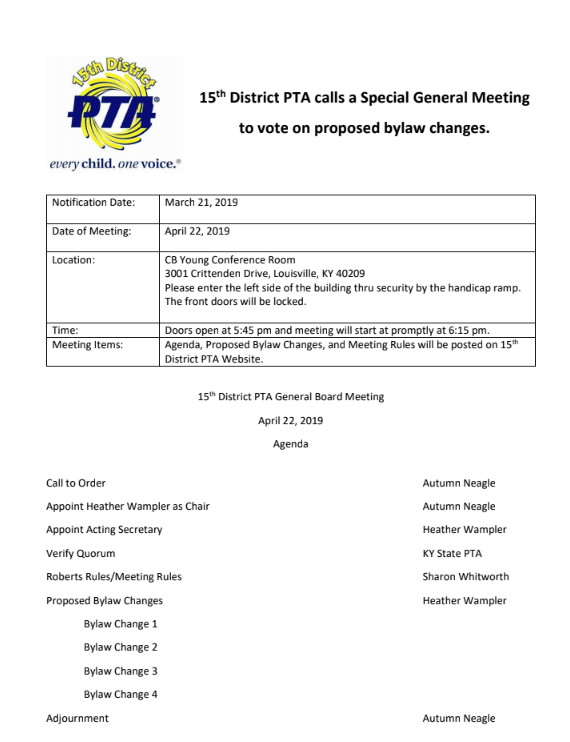 We invite you to join us on April 22, 2019 for a special called general PTA meeting to vote on proposed bylaw changes. Location: CB Young Conference Room at 3001 Crittenden Drive, Louisville, KY 40209 Please enter the left side of the building thru security by the handicap ramp. The front doors will be locked. Time – Doors open at 5:45 pm and meeting will start at promptly at 6:15 pm. Meeting Items below available for download. Section 6. If a board member has been removed from the 15th District PTA Board of Directors for cause, theft, malfeasance, or for not fulfilling their duties, they shall not be eligible to hold a position on the 15th District PTA Board of Directors. Appeal Process – If removed from office, after a minimum of two years, an appeal may be made. An individual may be reinstated by a majority vote of the 15th District PTA Executive Board. If a person has been removed from the 15th District PTA then to put them back on without a review would be careless. However, since people change and so does boards an appeal process has been added to makes sure that the 15th District is being fair to all those who want to serve. The appeal process is outlined in the 15th District PTA Standing Rules. If the above is approved then the following will be renumbered automatically. Section 6. Any member of a PTA/PTSA shall be eligible to hold office on the Fifteenth District Board of Managers. Section 7. If a member of the Board of Managers is absent for more than one (1) meeting without a reasonable excuse and/or not fulfilling his/her duties, their position may be declared vacant by a majority vote of the Board of Managers and the vacancy may/shall be filled. Section 8. Chairmen will serve concurrent with the newly elected president. Section 7. Any member of a PTA/PTSA shall be eligible to hold office on the Fifteenth District Board of Managers. Section 8. If a member of the Board of Managers is absent for more than one (1) meeting without a reasonable excuse and/or not fulfilling his/her duties, their position may be declared vacant by a majority vote of the Board of Managers and the vacancy may/shall be filled. Section 9. Chairmen will serve concurrent with the newly elected president. This new section just requires that we renumber so that we do not have two section 6 under Article IX. Section 7. 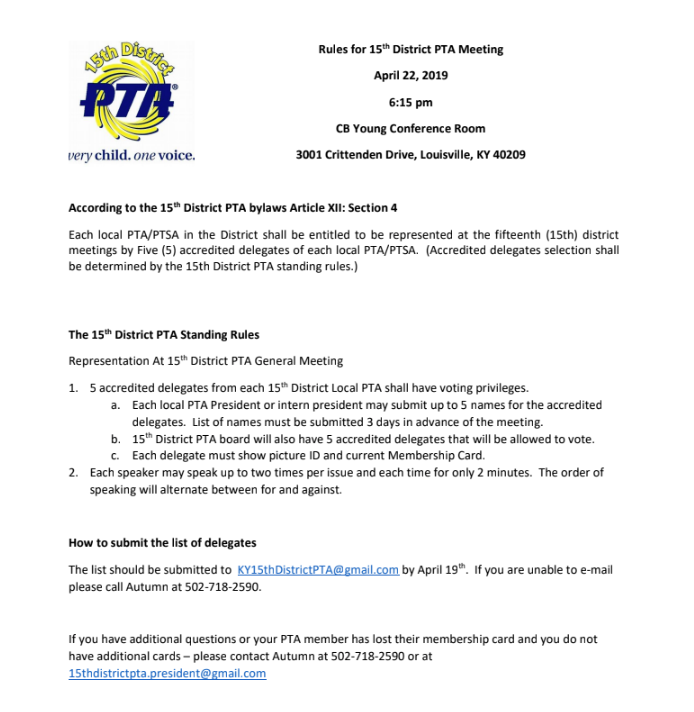 Any member of a PTA/PTSA shall be eligible to hold office on the Fifteenth District Board of Managers; except those who are not eligible in Article IX Section 6. The new section 6 requires that we make sure that all others sections reflect this change. In section 6 an individual cannot be on the Board of Directors if they have been removed. Section 6. Each local unit PTA/PTSA of this district shall pay annual dues of 20 cents per member to the district based on last year’s membership sold. Dues must be remitted by October 1st. Section 6. Each local unit PTA/PTSA of this district shall pay dues of 20 cents per member and are to be paid in the year collected. Dues must be remitted by the 15th of the month collected. The dues being paid as collected will align this with KY State PTA’s process for National and State dues. This also keeps the treasurer from having to send out yearly bills and track down and explain the process to new board members. It will decrease paperwork and mailing cost and will help in collection of dues. 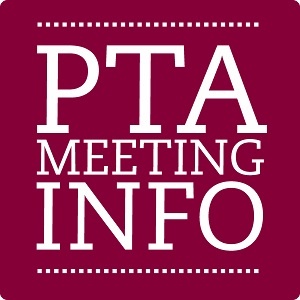 All this information was sent by the JCPS Pony to each PTA, Mailchimp to each PTA Officer who submitted their e-mail contact information, and by mail to each PTA Officer who submitted their home address.